Today I want to share with you about a huge mistake most of us make in marriage. I remember a joke that a man from church tells and I find the thoughts of the joke to be very applicable when it comes to marriage. On the day of a wedding, the bride enters the church and looks up to the groom. She sees the aisle, altar and him. Likewise, the groom looks down and sees the aisle, altar and her. And somewhere they come to the conclusion that “I’ll alter them”. Some of the faults of that person you intend to spend the rest of your life with are already evident. You say to yourself that you will change those things about that person when you get married. But when you get married they somehow seem to multiply and magnify. You notice that they leave the toilet seat up, do not replace the toilet paper when the roll is finished, they snore, snort, scratch etc. In our misguided understanding of things, we really work at altering the person we married into the “picture-perfect” person that we always dreamed of. This is a recipe for a lot of conflict because most times the person doesn’t want to be radically transformed into someone you dreamed of. Instead the person wants to be that person you dream of, with all of the faults and all. 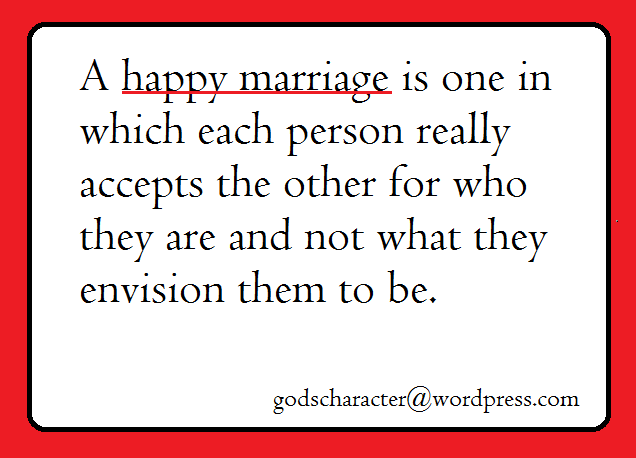 Marriage includes really accepting your spouse for who they are, in spite of their faults. This doesn’t mean that we ignore their faults and act like if they are perfect. Of course not! What is means is that we love them whether they change or not. As you grow in your marriage, you will personally want to become a better person for your spouse, because you love them and so will your spouse too. So instead of trying to alter your spouse, love them and live to be a better person for them. If each spouse choose to do this, wouldn’t marriages be absolutely wonderful? Tanya would like to connect with you! I blog at God’s Character, where I share about God’s love for us. I talk about everyday life where we see God’s character showing through. I also blog about home schooling, parenting and family life. ← Will I still hear you, Lord? Hi Ellie – thank you for visiting us today. I will have to let my community writer know that you appreciated her post. If we could all love our husbands as if this was our last day on earth with them. If we could desire husbands with a thankful heart and remember that amazing feeling we had when we fell in love. We can live as if it is our last day and we can go back to that moment in time when things get rough and remember the feeling of falling in love. Embrace that moment and choose to overlook our yucky feeling . We must remember that there is no fear in perfect love. I think I’ll have to write a post. Sorry Ellie. I just start writing and I can’t stop. Once again thanks for hanging out with us and I look forward to visiting with you again. I just checked out your site Ellie – i see you have a heart for God and Women. I look forward to receiving your emails in my box. Your new follower.